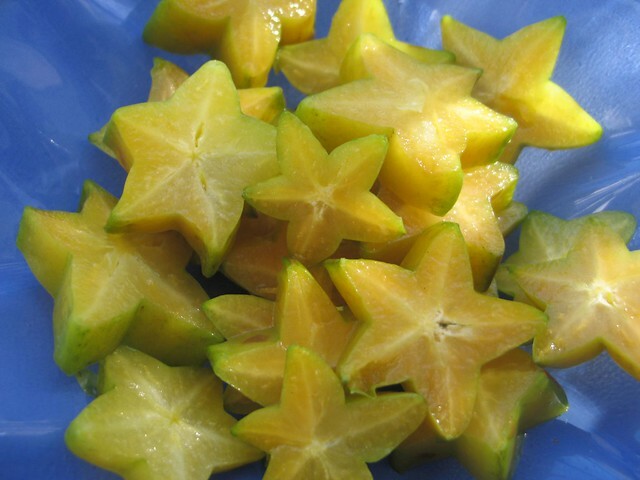 Commonly known as the starfruit, the carambola is a tropical to semitropical fruit that provides flair to any dish. Known more for its spectacular appearance, it still has an interesting flavour profile to offer. The carambola is a small tree native to south and southeast Asia (most likely Philippines) but is cultivated in the Pacific, Latin America, Caribbean and the Southern US. There are two types; a small sour type and a larger sweet one. It is a slow-growing evergreen that usually is 5-12 metres tall. The fruits are oblong in shape ranging from 6-15cm in length and up to 9cm wide. The carambola has a distinctive thin, waxy skin. Although it is not now found in the wild, the star fruit is originally native to Sri Lanka and the Moluccas, and has been cultivated in Southeast Asia and Malaysia for almost 1,000 years. The starfruit, or carambola, is a tropical fruit that got its name from the five pointed star shape when cut across the middle of the fruit. The fruits are juicy inside with a crisp texture and the famous star shaped cross-section. 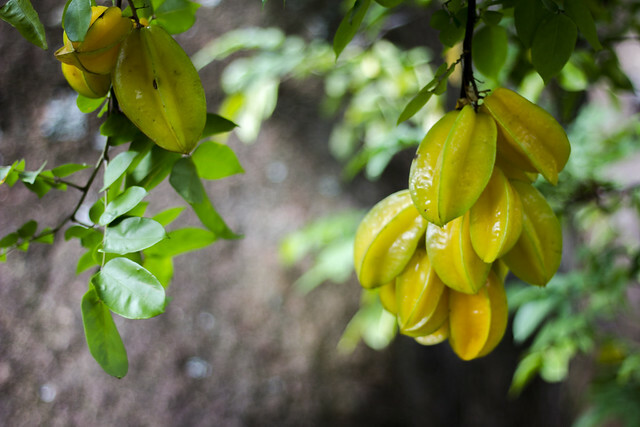 Within the genus Averrhoa there are two species which have edible fruit; the Carambola and the Bilimbi. The big distinction between the two is that the Bilimbi cannot be eaten raw due to its extremely sour flavour profile. Carambolas are sweet to sour depending on the variety with a combination of apple, pear and citrus notes. Its strong aromatic quality is produced by the oxalic acid it contains. It is crunch and firm but without fibre producing an extremely juicy fruit often compared to grapes. The more sour the variety of Carambola the greater the concentration of oxalic acid. The fruits rarely contain more than 4% sugar in the sweeter varieties. The fruit is rich in antioxidants, potassium and vitamin C.
The Carambola can be used to make relishes, preserves and added as a juice to drinks. It is often added to puddings and curries. Due to its unusual and attractive appearance it is used as an edible decoration. In its native land it is frequently paired with seafood or in dishes with other fruits. Carambola’s tart sweet flavour profile means it combines very well with other strongly fragrant fruits as well dominant flavour profiles. Its sharp flavour cuts through fish and seafood thus complimenting extremely well. Star fruit bruise easily, so handle with care. Non-ripe fruit should be turned often, until they are yellow in color and ripe with light brown ribs. Store ripe fruit at room temperature for two to three days or unwashed, and refrigerated, in a plastic bag for up to one to two weeks. They are great to eat out of hand as these tropical delights do not need to be peeled or seeded before eating. Simply wash the fruit, remove any blemished areas, cut crosswise to get the star shape, and eat. The sweet variety can be eaten out of hand or sliced and used as a garnish or in salads. They are also used in chutney, curries and tarts. The juice can be used in tropical drinks and smoothies.